We have been a manufacturer and supplier of Wire to Rope Halyards and wire/rope Furling Lines for over 45 years. Our customers include many marine supply outlets, sailmakers and rope makers in Canada plus we have a loyal following of retail customers that we have built up over the years. 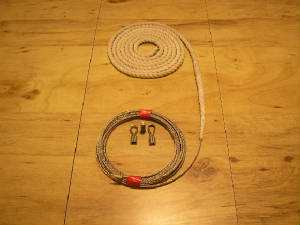 We build new Wire to Rope Halyards and wire/rope Furling Lines using type 316 stainless wire and low stretch braid tails. 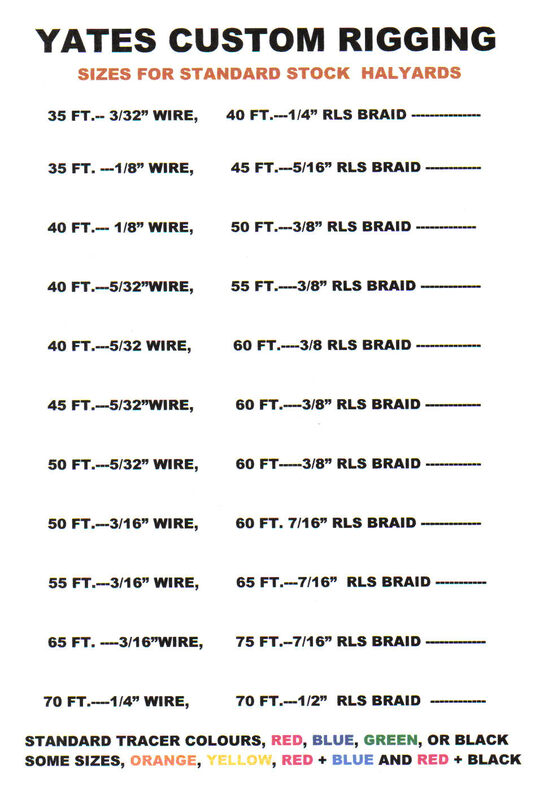 We have wire sizes from 3/32 to 1/4 dia. 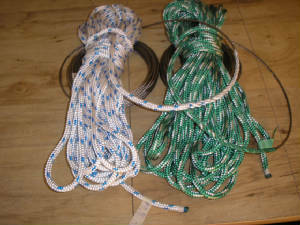 and we stock rope in various tracer colours from 1/4 to 5/8. 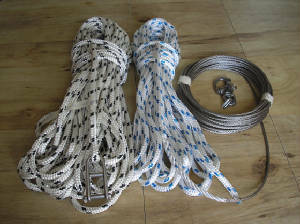 To speed up delivery we have a stock of pre-made halyards with longer tails to fit most standard boats with winches back on the cabin top. Please click on the picture to your right to view our quality product. 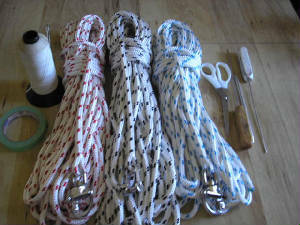 We have some solid colours in 5/16 and 3/8 for tails on furling lines and smaller halyards. We can also do repairs like new tails on your own wire or make a splice using customer supplied material. 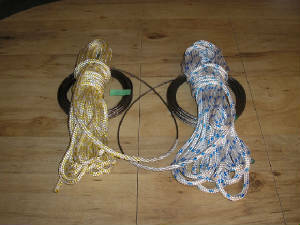 If you have a special requirement or a problem with your halyards we would be glad to advise. 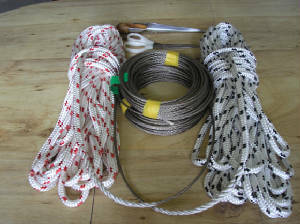 Many sailors have a problem with "meathooks" in halyard wire caused by the wire moving across stainless steel guides at the masthead or by riding across stainless wearbars at the exit boxes. 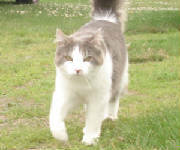 The use of galvanized wire instead of stainless steel should be considered. 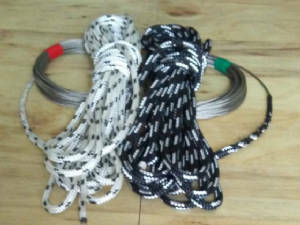 Many sailors that have switched to hi-tect materials for halyards have once again replaced them with new wire to rope halyards like the originals because of durability and lower price. 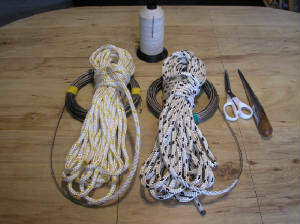 If you have trouble trying to find a replacement ROPE TO WIRE HALYARD for your boat we are still making new ones every day like we have done for nearly 50 Years. 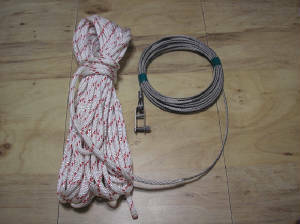 We also carry a limited amount of spectra/dynema in small diameters for halyards with pigtails. We developed over thirty years ago a special core splice for hi-tect materials like kevlar and vectran that is now used by others in the marine industry. Our Wire to Rope halyards have been tested by experienced sailors in both club races and in long distance ocean races throughout North America. 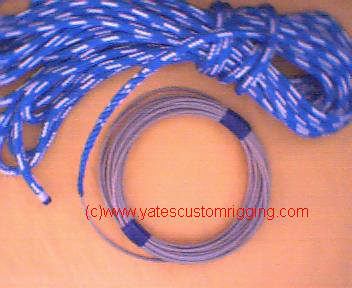 Cruising boats using Yates Custom Rigging Wire to Rope Halyards have made many ocean crossings. Today we are just renewing many original halyards on production boats that we made over 30 years ago. We have done random strength testing on our halyards over the years and we have always seen more than 80% of breaking strength of the wire. Sometimes we have seen 3700# wire break at more than 3400#. 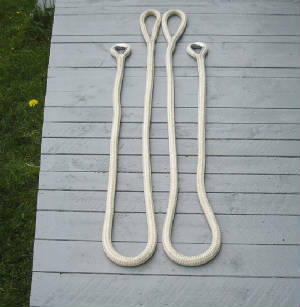 We make all halyards as if we were using them to go aloft ourselves. 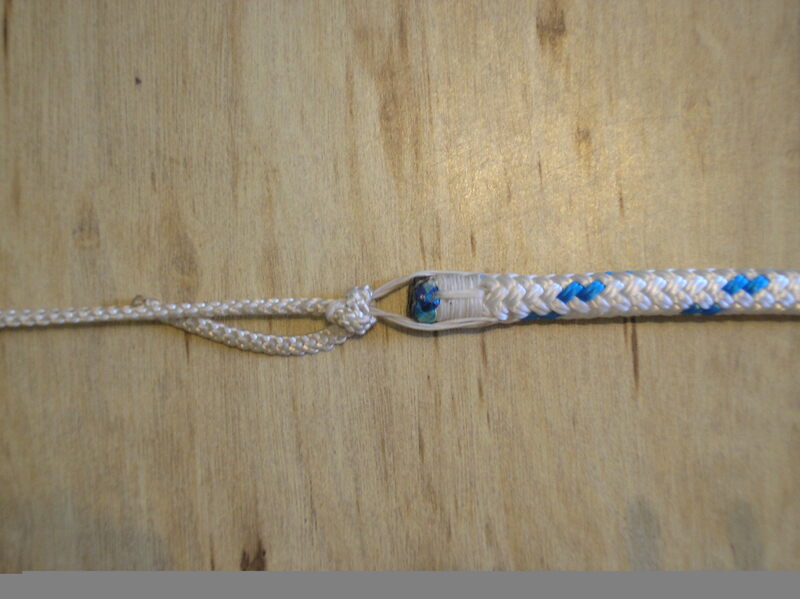 The strength is directly affected by the amount of taper thus the reason for the longer splice on the outside. 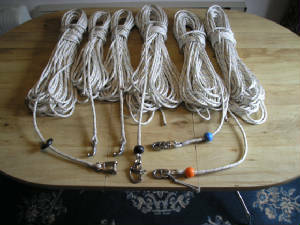 Most wire to rope halyards today have to take heavy sailing loads with the wire cut short to use modern rope clutches. 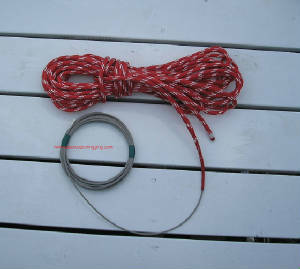 Having wire on the winch nearly disappeared when we started using braided rope for tails. 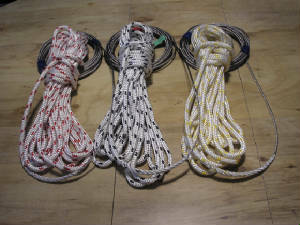 If you are shopping around for Wire to Rope Halyards, just remember all halyards are not created equal. Compare the halyard you are buying with any marine supplier selling YCR Halyards in their store or on the internet. Price is not all that matters, I make every one as if it might be taking me up and down the mast for years to come. I made my first wire to rope halyard in April 1968, 49 years ago. Yesterday I made a new Jib Halyard for a CAL 36 and that American Classic has been out of production for a very long time. 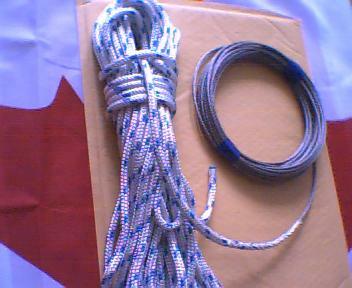 For our American friends there should be an advantage buying your halyards in Canada. The Canadian dollar's value sits at about 76 US Cents. We will quote you a price in CDN dollars and you can pay by PAYPAL in US dollars..
We also have a motorized Kearney Swaging machine and have the capacity to do "renew" on lifelines. We carry Plastic Coated type 316 wire, colour white only, in 1/8 x 1/4 and 3/16 x 5/16 sizes and have stock of most parts and access to more studs and fittings so we can re use many parts that you have on your old lifelines. This machine is portable and we can go to your boat at dockside for local people needing replacements in our area. 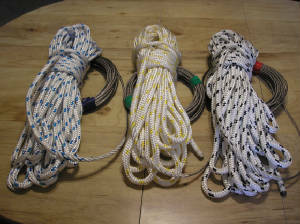 We have custom made thousands of sets of new and replacement lifelines on sailboats over the past 40 years. 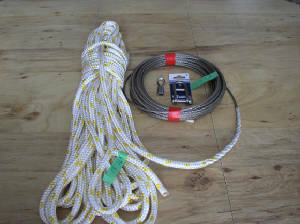 We can supply you with instructions on how to measure your boat for replacement lifelines or just to copy the old ones using new wire and swage studs where possible for the turnbuckles and other parts. We also do splicing for the local fishing industry like end to end splicing on seine purse lines and heavy marine double braid from 3/4 to 2 1/4 inch diameter. 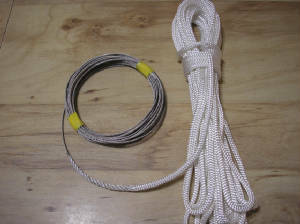 We also make smaller dock lines with galvanized thimbles and whippings on the bitter ends. Many yacht clubs use this type where boats are required to be shackled to the dock. We make custom lengths in 1/2 and 5/8 dia. braid. 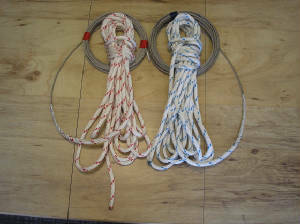 We also do end to end splicing in double braid for two speed mainsheet systems used on many racing sailboats. 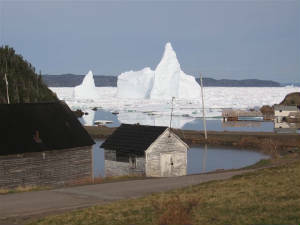 Just a lovely day to view Icebergs from the hill on the main road. 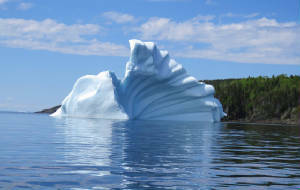 Lots of 10,000 year old ice cubes in this Berg!! 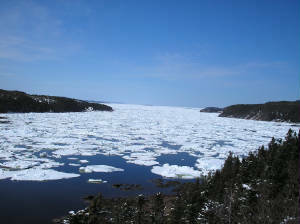 Great weather but lots of pack ice after the Easterly winds last week..
CS 36T #2332 from Halifax moored in Fortune Hr. 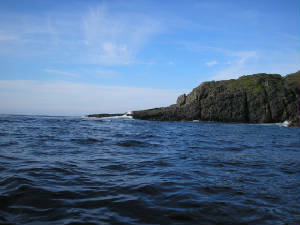 Fred G. on his sail "Around the Rock" in 2013................ Click on picture to enlarge. 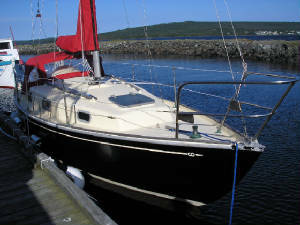 Contessa 26 in St. John`s, NL. ------MUST SEE--------- Drone aerial Video of CFV. 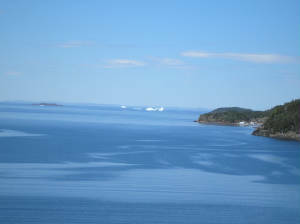 SILVER FOAM, a 64 ft. CRAB BOAT owned and sailed by Garfield Tibbett out of Catalina, NL. A great Watch!! 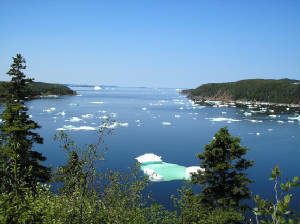 Right here in Cottrell`s Cove. 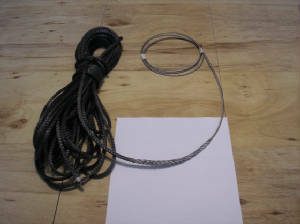 1/8 wire, 5/16 Braid Custom made for customer in Ont. 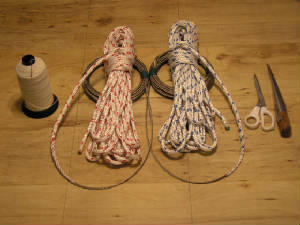 Made for a classic wooden boat in the USA using a spun twisted polyester tail. 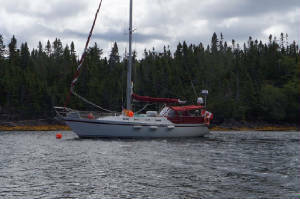 NEED NEW SAILS FOR YOUR BOAT OR REPAIRS TO YOUR OLD SAILS Performance Sails from Ontario and DURK STEIGENGA has now moved to Nova Scotia and is set up in the Mahone Bay area. Click here for Performance Sails Website. Pictures of Yates Oceanfisher 20 Runabout with center console. 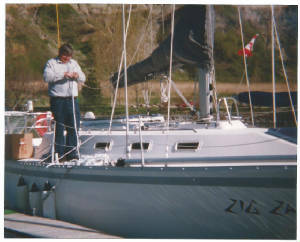 Want to buy a `like new` used freshwater sailed sailboat, Contact Pat Sturgeon Yachts in Toronto. Looking for Ray Singh, Rays Marine Systems. 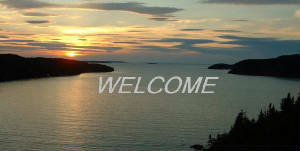 He is a well known Supplier and Installer of Upgrades, both mechanical and electricial to boats in the Toronto Area. Formerly from CS Yachts. 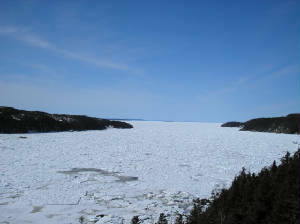 Would you like to sail Canada`s Inland Sea, Bras d`Or Lakes on Cape Breton Island this Summer??? 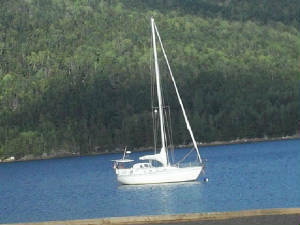 Charter a Nonsuch 26 for day sailing out of St. Peters, Cape Breton near the Canso Causeway.